Just had to make a post in honor of reaching 200 fans on Facebook! Such a good number to see, and sales are going well. Very excited to have all these people to share future stories with! Nothing better than having an audience that subscribes to all the silly ideas in my head. Categories: Uncategorized | Tags: aspiring, author, book, books, ebook, facebook, fans, write, writer, writing | Permalink. So, I’ve kind of been a little bit all over the map lately. With my writing progress, my blogging, and even what book I’m currently working on. I just can’t seem to subscribe to much consistency, these past couple months. I keep thinking I finally have it all back together, only to have my newfound dedication fray, whether from lack of inspiration or life events that plant obstacles in my schedule. (I’m working a new part-time job, which is part of the upset. It’s taken a little bit of getting used to, and has required a revamping of my usual weekly schedule. I work the graveyard shift on weekends, now, which is new and different for me, but it’s a job where I have a lot of down time, so I actually have the freedom to write a bit, if I can get my drowsy brain to commit to plotting between 11:00pm and 5:00am). Anyway; after getting stuck on my novella Lunis and not writing anything for a week or so because I was determined that it would come back to me… It hasn’t come back to me, and I would rather be writing something than nothing at all, even if it’s not something that furthers my ‘current’ project. I really don’t want to put Lunis officially on hold, which is probably what will happen if I start something new, but I did come up with a new idea for a book that’s really working for me, so I’m afraid that’s the direction I’m going. But the cover of Lunis is finished and in my gallery, so I’m committed to finishing the book sooner or later. I will, I promise. In the meantime, I’ll be thinking about the sequels to Breathtaker, and working on my new idea, which is for a Young Adult novel entitled The Tournament of Eden. I plotted half of it over the weekend at work, and the other half today, and then sat down and wrote the first chapter. And I feel like I’ve gotten some of the magic back that I used to feel when I sat down to write a book (haven’t felt that way in awhile), so I’m sticking with this! Only a few of the books that I have published are ones that I actually felt that way about; the rest that have that magic ‘spark’ are ones that I started way back in the day and had to interrupt because of life, and now I’m afraid to return to them in fear that I’ve neglected them and grown too far apart from them to still possess their particular spark inside me. I’m afraid I won’t do them justice, anymore, unless I can find a way to return to the essence of those days and re-capture it. So, instead, I sit here just trying to come up with neat concepts and write books that are okay, that I feel are safely good and that I’m not afraid of ruining, but I’m not all that excited about. Terrible, isn’t it? What kind of aspiring writer writes all the books she’s least excited about first? It’s true, though – ironically, I’ve so far mostly published books that were never intended as my ‘main’ or ‘first’ books. The ones intended as ‘on the side’ things always end up getting finished and published, probably because, as I just mentioned, I’m not afraid to ruin them, so I just go ahead and write them. HOW DID MY WRITING DEBUT END UP SO BACKWARDS?! It’s become clear to me that my priorities as an aspiring writer have gotten a little mixed up. (Let’s be clear, here: a few of the books I have published ARE ones I was excited about, and that I’m happy to have out there as debut material, but there are so many others that I’m completely psyched about, and have neglected in the interests of writing something I’m not afraid of ruining, that I can spew out faster). Categories: Books, My Books, Self-Publishing, Writing | Tags: author, book, books, fiction, inspiration, write, writer, writing | Permalink. 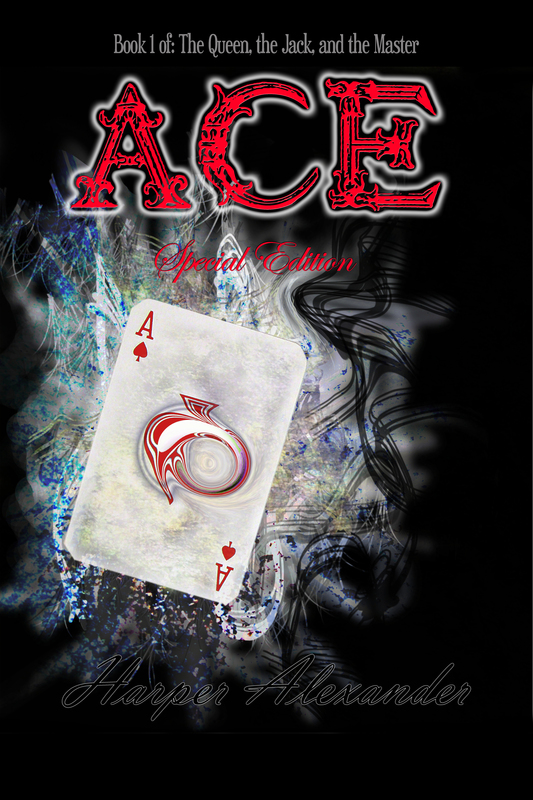 The special edition of ‘Ace’ has just gone live in the world of e-books. Check it out on Amazon! ‘Ace’ Special Edition. The special edition of Ace includes… Notes about the inspiration for the book, a list of interesting facts about the book in general, and a never-before published ‘Ace’ short story! Categories: Books, My Books, Reading, Self-Publishing | Tags: author, book, books, fiction, release, write, writer, writing | Permalink. Twilight fell like a beast crouching in the grass. I met its horizon-gray eyes out the window, pausing my work in realization. I clutched the garment I was mending closer for a moment, taking comfort in its texture as the gray hour glazed everything outside, silently sapping it of life. It had bled out as if from the subtle slitting of sunshine wrists, which none of us noticed until the body had gone cold. And now night crouched on its precipice, bloody from the catch, ready to pounce lower and walk among us. Categories: Books, Excerpts, My Books, Reading, Writing | Tags: book, books, dystopian, excerpt, fantasy, fiction, reading, Twilight, write, writer, writing | Permalink. Imagine a library that goes on forever – vast, dark and silent. Nobody walks its corridors or dusts its shelves. 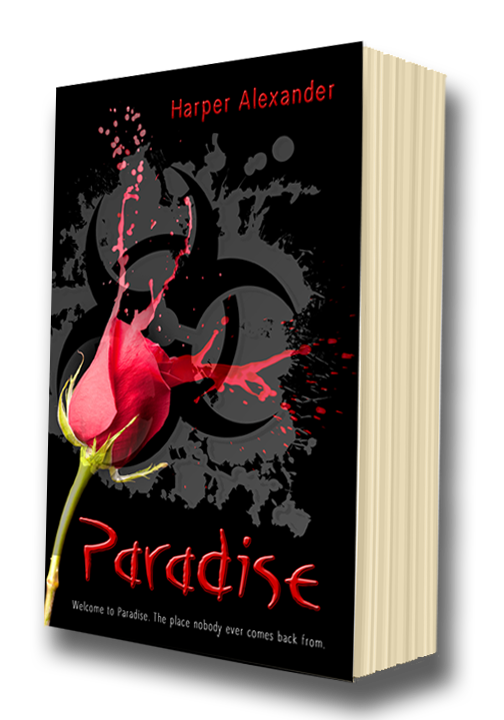 Millions of books are crammed side by side – adventures, romances, mysteries and comedies. They have never been read, for these are the books that do not yet exist. They sit there, waiting to become real. There are unwritten stories everywhere, and sometimes I stumble across them. Now and then, when I tell someone I’m a writer, they get this shy, keen look in their eye. Suddenly I know what they’re going to say next. They know I won’t make fun of them. It’s exciting to hear them talk about their secret tale, the one that only exists in their head. Just for a moment I feel like I’m sneaking a peek into the Library of Unwritten Books. I just have to take a moment to say – OMG, I’ve just discovered the total awesomeness of employing Pinterest as an author! I had already been having fun with Pinterest with a regular ol’ account, like many people, just pinning random appealing things, but I kept running into things that served as great story inspiration, and trying to keep all that stashed in the midst of all the other non-story stuff was quickly becoming stifling and cluttered. It didn’t take long before my ‘Book Inspiration’ board was bursting with random goodness of its own that really needed to be divided up into sub-categories. But I didn’t want to bug all of my regular followers with a BUNCH of ‘book’ boards, or even just the escalating amount of mere book-related pins, so after despairing for awhile and not changing a thing, I realized I could create a COMPLETELY DIFFERENT PINTEREST ACCOUNT FOR MY AUTHOR SELF. Duh. And, let me tell you, I haven’t had so much fun in a long time. If any of you are like me, you’ve long either surfed the web for inspiration or happened across it by chance and had the thought ‘DRAT, this is perfect; it’s like they made it JUST FOR MY BOOK, AND I MUST HAVE IT – NOW NOW NOW NOW NOW!’ – but of course, you can’t have it at all. That glorious piece of mind-reading inspiration isn’t yours to attach to your work. I’ve run into so many things that could have been stellar representations of my stories or aspects therein, and it’s painful to move on and accept that it will never be yours to employ for your own purposes. AHH, the injustice! Such a taunt! After years of doing just that (dragging myself onward), I am so incredibly excited (way too excited, in all honesty) about the prospects Pinterest provides to change that. For anyone who doesn’t know, Pinterest is basically a cool little (big) place where you create different ‘boards’ (categories/files) and stick relevant ‘pins’ on (in) them. Pins are images of different things. Pretty much anything you can imagine. You can pin virtually any image from any site onto one of your ‘boards’. This is allowed because it preserves the source information and all that, so it’s pretty much equivalent to posting a link (more or less), except it’s in image form. Yatta yatta yatta, bla bla bla. You get the picture. Which means that, as I screamed at my sister, “Oh my gosh, I CAN steal everybody else’s epic coolness and use it for my own glory! JUST LIKE I’VE ALWAYS WANTED!’. As good as if you had mad skills in every medium and plenty of spare time and resources to dream up sketches and movie-stills and character portraits and all kinds of cool extras for your stories yourself, you can put all these things by other people into boards dedicated to your books, and no one’s the wiser (at least, nobody cares that they weren’t originally designed specifically for your book), and it’s all perfectly allowed and WAY TOO MUCH FUN. As a fan, I would totally love to peruse an author’s collection of inspiration for a given book, to see how she imagines the characters and really get a feel for the atmosphere and all that – and as an author, it just really helps with inspiration. There is something so cool about forming a collection of images that captures your ideas and brings them together, giving you this broad, vivid vision of everything you imagined, made real and whole before you. And I’m sure I’m not the only one who has ever been compelled to have a character look just like a certain actor/singer/etc who happens to be awesome, but there’s just no hope of ever really making noise about that because you can’t just splice George Clooney onto the cover of your book and call it a catered day. (At least, I don’t recommend it.) So this is a cool way to just kind of pull a picture of that given person onto the scene as a source of inspiration, and display them next to all that other cool stuff that makes your book what it is. You probably get the picture well enough that I can temper the tirade and let everyone discover the extent of the fun for themselves (if you haven’t already; I may be the one that’s just a little slow to jump on the end of the bandwagon, and you’re all shaking your heads at me now, saying ‘I could have told you all that’. Regardless; I highly recommend Pinterest for authors both as a source of inspiration and a potential avenue of promotion, and, of course, as a totally awesome and appealing thing to share with the fans you already have. So – go do it! I can pretty much guarantee that once you start, it will be addicting. On that note, if you’ll excuse me – I’m off to return to my new hobby of shamelessly stealing the glory of about a million other people. Categories: Books, My Books, Writing | Tags: author, book, books, inspiration, pinterest, tips, write, writer, writing | Permalink.